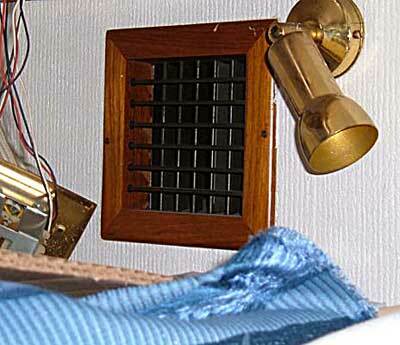 This small vent was the only source of air for this stateroom. The air flow was controlled by the V.I.P. Stateroom - so you are left to the mercy of whomever was in the V.I.P. Stateroom. Also a seldom thought about subject is air lock, and what happens when you do not have the right intake. This is the last vent in line from the V.I.P. room and already subject to restriction. When this little room fills with air, because the door is closed for privacy, then the air coming in needs more force. Making this room independant will solve all of the above. I would hate to find out the next day that my guests were sweating all night. DOMETIC to the rescue. 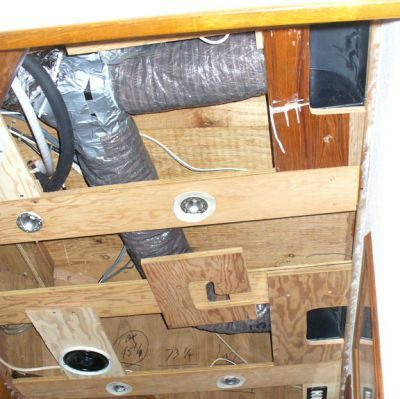 It is proving quite difficult trying to figure out how to run the duct work for this room and the port salon duct that needs to go up through the cabinet above. I thought I had it all figured out but discovered that the wall was not where I thught it was. The saving will be this 4 1/2" space between the back of the salon dinnett and the closet. 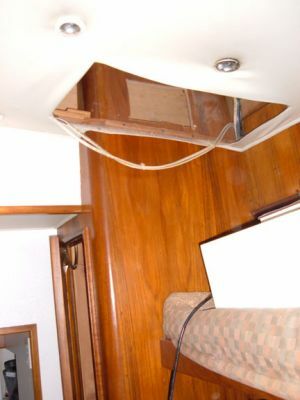 The original plan called for the port salon duct to come though the fake wall located under the dinnett seat (pictured here on the upper left) and then up through the TV cabinet to the ceiling vent. Unfortunately, the wall is actually pictured on the lower left. 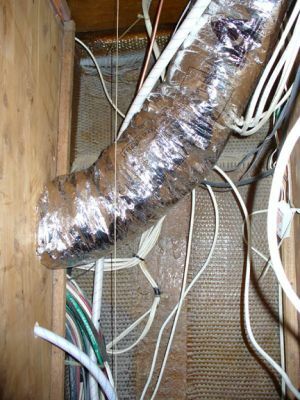 The duct will now have to come through the closet. 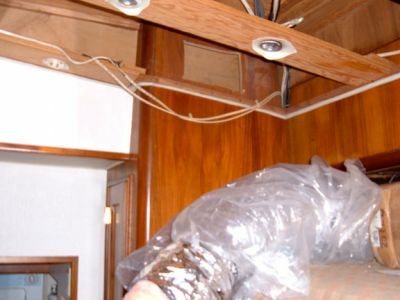 The real problem is how to get through the closet and up to the TV cabinet without taking space from the upper bunk. The solution will be this 4 1/2" space between the walls. 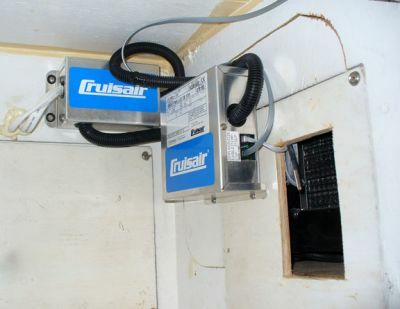 This air unit will be installed and give independent control to the guests. Previously the guests were at the mercy of the VIP Stateroom and only a very small 3" outlet was in the room. The additional problem with the previous configuration is that a room can get an air lock which prevents the little bit of cool air from entering. This shelf, located in a unused area, will house the air handler. The space is next to a storage area and over the fuel tank. 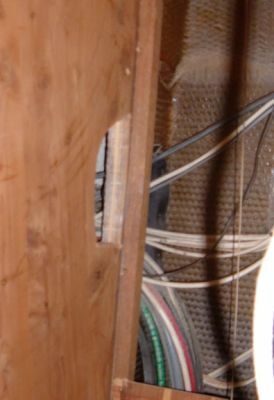 The back area will allow the duct to run into the closet. 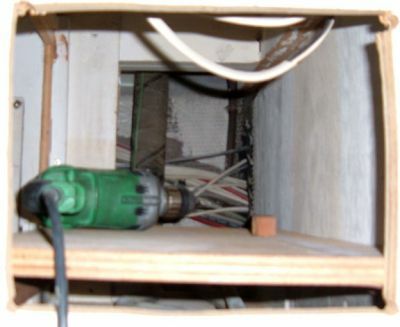 This photograph was taken from inside the room and through the hole that will house the air vent supply. The previous photograph was taken from inside the storage area. This photograph was taken from inside the closet. The hole cut will allow 5" duct work to be run above the head liner and split into two 4" ducts. The 5" duct will run from the air handler into the back of this closet aft, then and up under the head liner. 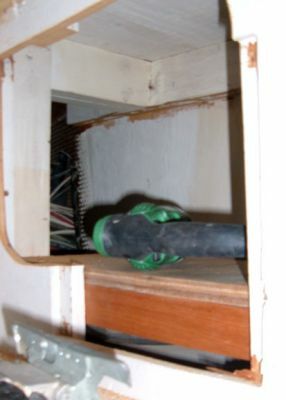 Once positioned through the closet and above this head liner, the duct will split into two 4" ducts that will divert air via two ducts into the room. This duct splits 5" into two fours. I now have to fabricate the mounting in order for the outlets to be mounted. 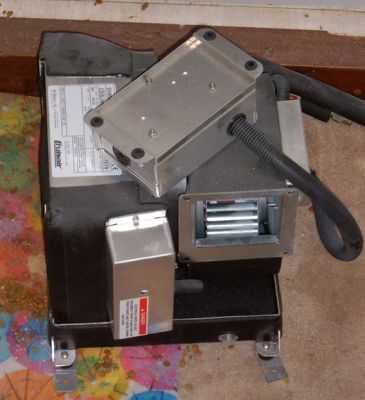 The box in the background is for power connection and the box in the foreground is for the moudulating system. The three Staterooms are cooled by the 32,000 BTU compressor in the engineroom and the moudulating system allows each room independent control. 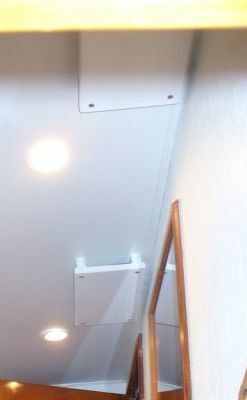 The duct runs through the closet and up into the headliner of the room. 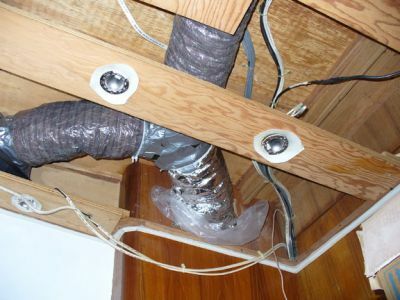 The 5" duct is split into two 4" ducts and ends in these outlets mounted in the ceiling. 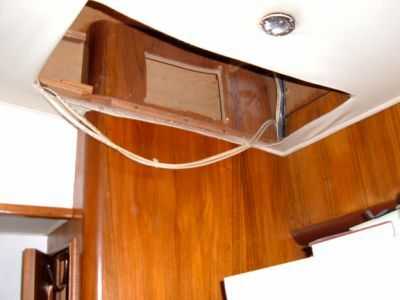 Once the headliner is in place, a board will be mounted approximately 2" below these outlets. This will disperse the air into the room rather than have it shoot down to the floor. Two white-boards 7" X 12" were cut and edges were rounded. 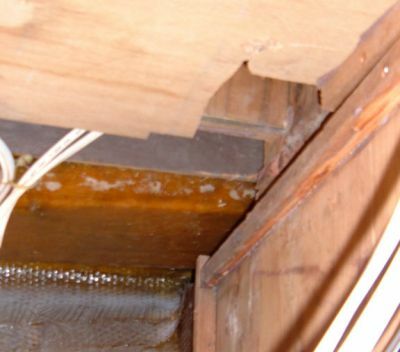 They were then placed over the air ducts placed 1 1/4" away from the ceiling. They deflect the air so that it comes into the room nicely. It also makes very little noise. We love it.